Similar to intersectBed, windowBed searches for overlapping features in A and B. 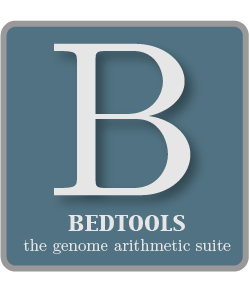 However, windowBed adds a specified number (1000, by default) of base pairs upstream and downstream of each feature in A. In effect, this allows features in B that are “near” features in A to be detected. -w Base pairs added upstream and downstream of each entry in A when searching for overlaps in B. Default is 1000 bp. -l Base pairs added upstream (left of) of each entry in A when searching for overlaps in B. Allows one to create assymetrical “windows”. Default is 1000bp. -r Base pairs added downstream (right of) of each entry in A when searching for overlaps in B. Allows one to create assymetrical “windows”. Default is 1000bp. -sw Define -l and -r based on strand. For example if used, -l 500 for a negative-stranded feature will add 500 bp downstream. By default, this is disabled. -sm Only report hits in B that overlap A on the same strand. By default, overlaps are reported without respect to strand. -u Write original A entry once if any overlaps found in B. In other words, just report the fact at least one overlap was found in B. -c For each entry in A, report the number of hits in B while restricting to -f. Reports 0 for A entries that have no overlap with B. By default, windowBed adds 1000 bp upstream and downstream of each A feature and searches for features in B that overlap this “window”. If an overlap is found in B, both the original A feature and the original B feature are reported. For example, in the figure below, feature B1 would be found, but B2 would not. Instead of using the default window size of 1000bp, one can define a custom, symmetric window around each feature in A using the -w option. One should specify the window size in base pairs. For example, a window of 5kb should be defined as -w 5000. One can also define asymmetric windows where a differing number of bases are added upstream and downstream of each feature using the -l (upstream) and -r (downstream) options. Especially when dealing with gene annotations or RNA-seq experiments, you may want to define asymmetric windows based on “strand”. For example, you may want to screen for overlaps that occur within 5000 bp upstream of a gene (e.g. a promoter region) while screening only 1000 bp downstream of the gene. By enabling the -sw (“stranded” windows) option, the windows are added upstream or downstream according to strand. For example, imagine one specifies -l 5000 -r 1000 as well as the - sw option. In this case, forward stranded (“+”) features will screen 5000 bp to the left (that is, lower genomic coordinates) and 1000 bp to the right (that is, higher genomic coordinates). By contrast, reverse stranded (“-”) features will screen 5000 bp to the right (that is, higher genomic coordinates) and 1000 bp to the left (that is, lower genomic coordinates). This option behaves the same as the -s option for intersectBed while scanning for overlaps within the “window” surrounding A. See the discussion in the intersectBed section for details. This option behaves the same as for intersectBed while scanning for overlaps within the “window” surrounding A. See the discussion in the intersectBed section for details.